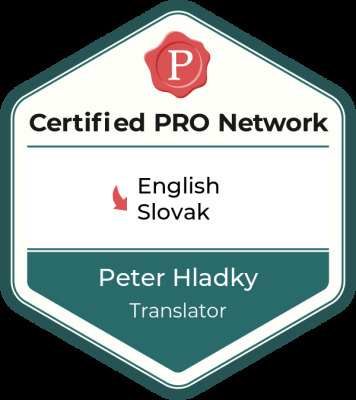 Peter Hladky - English to Slovak translator. Translation services in Mechanics / Mech Engineering - Electrical engineering, machinery engineering, nuclear power engineering, power engineering, civil engineering, IT, computers, hardware, software, military, woodworking technology, medical technology, patents, intellectual property, business, economy, laws. Experience Years of translation experience: 31. Registered at ProZ.com: Sep 1999. Became a member: Jun 2006. Professional practices Peter Hladky endorses ProZ.com's Professional Guidelines (v1.0). 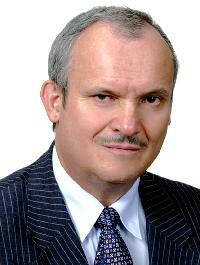 I provide translations from English into Slovak, Czech and Russian languages, mostly in technical areas including electrical engineering, information technology, mechanical engineering, power engineering, nuclear power engineering, nuclear technology, automobile and military technology, medical technology, but also in the area of business and economy - contracts and agreements, business offers and business correspondence, patents, intellectual property. I have technical background. I graduated in Electrical Engineering at the Department of Nuclear Physics and Technology at the Faculty of Electrical Engineering at the Slovak Technical University in Bratislava. I post-graduated in Biophysics at Department of Biophysics at the Faculty of Mathematics and Physics at the Comenius University in Bratislava. I have been working with English special documents, mostly technical documents within and beside different occupations and jobs since finishing the technical university in 1979. I work as a full time freelance translator and interpreter without any other jobs since January 1998. Keywords: Electrical engineering, machinery engineering, nuclear power engineering, power engineering, civil engineering, IT, computers, hardware, software, military, woodworking technology, medical technology, patents, intellectual property, business, economy, laws.